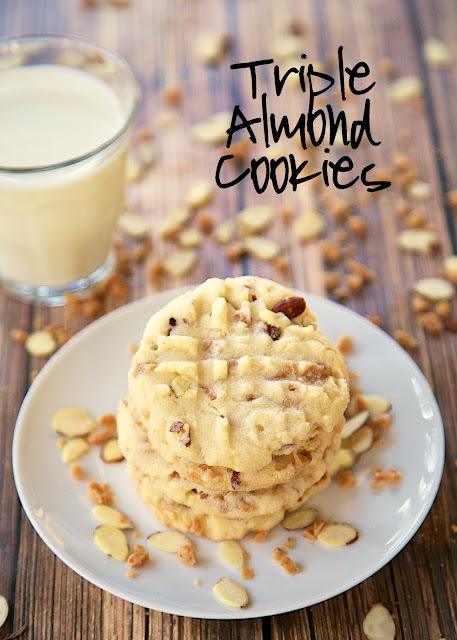 Triple Almond Cookies Recipe - cookies packed with tons of great almond flavor - almond extract, chopped almonds and almond toffee bits! We ate WAY too many of these cookies. Makes a ton. Great for a potluck! If you love almond flavors, then you are going to absolutely love these Triple Almond Cookies! They are packed full of tons of almond flavor. Almond extract, chopped almonds and almond toffee bits. They are dangerously delicious! The house smelled amazing while these cookies baked. We couldn't wait to give them a try. We both had a really hard time controlling ourselves around these cookies. I gave most of them away to my parents so we didn't sit around the house eating them all day (because we totally would have). This recipe makes a lot of cookies, so this would be a great dessert to take to a potluck. Beat butter at medium speed of electric mixer until creamy. Gradually add sugar and powdered sugar, mixing well Add oil, eggs and almond extract, mix well. Combine flour, baking soda, salt and cream of tartar. Add to butter mixture, mixing well. Stir in almonds and toffee bits. Scoop cookies with a medium cookie scoop (2 Tbsp). Roll dough in granulated sugar and place on a parchment lined baking pan. Flatten cookies in a criss-cross patter with a fork dipped in granulated sugar. Bake for 10-12 minutes. Cool slightly on pan and remove to wire rack to cool completely. I have a huge bag of sliced almonds leftover from Christmas in my freezer needing to be used. This is the perfect recipe to make for 4 teenage grandsons that coming over all the time! I made these today and they were soooo good. They will be on my holiday cookie list to make every year.They will also be one of my surprise gift to my family and friends. I believe it would be vegetable 'oil' or she would have said 'shortening'. 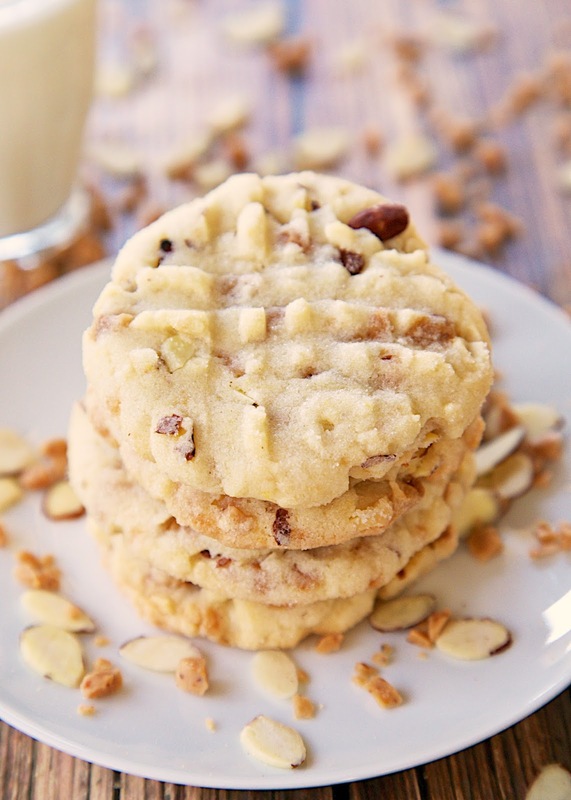 Why is it called TRIPLE almond cookies? Because there are THREE forms of almonds in the cookie. I am unable to find almond toffee bits. Is there a good substitution? Could these be rolled in sugar, then flattened with fork, and then frozen?